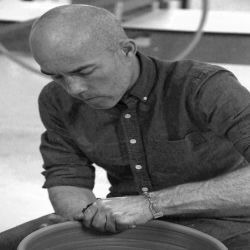 An artist my entire life, my work is currently focused on a daily studio practice in ceramics. I am a self-taught potter and have a long history with art making and invention. The visual vocabulary of my work stems from an uninhibited creativity that was cultivated during early childhood and has extended into my present labors. I have been blessed with creative intuition, and through a lifetime of creative experience I have found that the most reward from artistic endeavors comes from the act of doing. I find great emotional release and serenity through creation. My artistic intentions veer more toward abstraction and the emotional functions of objects rather than literal representational depictions. I find inspiration from Post-War studio pottery as well as Art and Design of the Mid Century era.